Boulder, CO – Gravity Renewables Inc., an investor-backed owner, operator, and developer of small hydroelectric power plants in the United States has released its first ever River Watcher Report. Gravity Renewables brings long-term, cost-effective clean energy to electricity consumers, helps conserve and restore historical hydroelectric sites, and promotes educational and recreational opportunities in the communities it serves. The River Watcher Report is designed to be a nontraditional annual report that measures Gravity’s commitment to the riverine environments where it works, which includes a drainage basin of nearly 10,000 square miles. The report outlines Gravity’s goals and 2018 outcomes within the areas of shared knowledge and stewardship, river management and public safety. 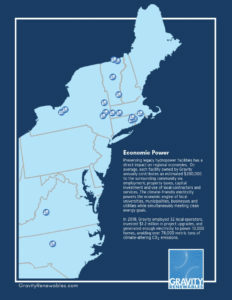 It also details the economic reach its facilities have on the surrounding region. In its first year, the two-page report is expected to grow as Gravity continues to identify and track key indicators for future reports. 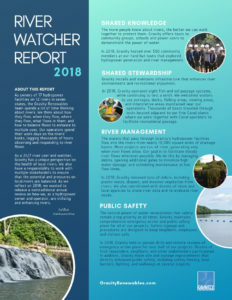 Click here to view the 2018 River Watcher Report. Gravity Renewables is a leading national owner, operator and developer of small hydroelectric power plants. Small hydropower provides predictable, reliable, affordable clean energy that’s locally produced. By making a long-term commitment to these neighborhood facilities, Gravity restores and conserves important historical sites, employs local operators and promotes educational and recreational opportunities in the communities it serves. Gravity currently has more than 50 MW of hydroelectric projects operating and under development across the country. For more information, please visit www.gravityrenewables.com or contact us at 303.440.3378. Follow Gravity Renewables on Twitter or Facebook.